Eekhout, I., Enders, C.K., Twisk, J.W.R., De Boer, M.R., de Vet, H.C.W., Heymans, M. W. (2015). Longitudinal data analysis with auxiliary item information to handle missing questionnaire data. Journal of Clinical Epidemiology, 68(6):637-645.
fghanistan: a 5 year follow-up. Eekhout, I., Enders, C.K., Twisk, J.W.R., De Boer, M.R., de Vet, H.C.W., Heymans, M. W. (2015). Analyzing Incomplete Item Scores in Longitudinal Data by Including Item Score Information as Auxiliary Variables. Structural Equation Modeling: A Multidisciplinary Journal, 00, 1-15. Eekhout, I. (2014). Don't Miss Out! 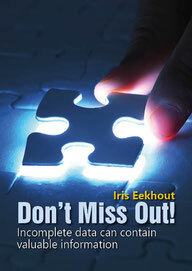 Incomplete data can contain valuable information. PhD Dissertation. de Vet, H.C.W., Mullender, M.G., Eekhout, I. (2017). Specific agreement on ordinal and multiple nominal outcomes can be calculated for more than two raters. Journal of Clinical Epidemiology, Dec 4 Epub. Pubmed Link. Eekhout, I., Reijnen, A., Vermetten, E., Geuze, E., (2016). The change in posttraumatic stress symptoms after deployment to Afghanistan: a 5 year follow-up. Lancet Psychiatry, 3(1):58-64. Terluin, B., Eekhout, I., Terwee, C.B., de Vet, H.C.W. (2015). Minimal important change (MIC) based on a predictive modeling aproach was more precise than MIC based on ROC analysis. Journal of Clinical Epidemiology, Mar 28.